Last Thursday, Civic Engagement, Student Association, and a panel of our peers set forth to talk about a subject that not everyone is comfortable with: Race. The objective was to open up a path of communication for people to begin to understand one another; to grasp what others think about people’s relationship with each other at SUNY Oswego. The result was nothing short of perfect. Students came together, asked insightful questions, and were open about making others aware of their problems and concerns, doing so with candor and respect. Questions, asked by moderator Chris Collins-McNeil, helped to spark conversation first among panel members followed by comments and questions from the audience. Some of the questions were tough, especially those submitted by Dr. Kenneth Marshall, professor history here at SUNY Oswego. Do you believe that racial problems exist on campus? In what context do they manifest? What does the term diversity mean to you? Do you believe that diversity on campus is all talk and no action? 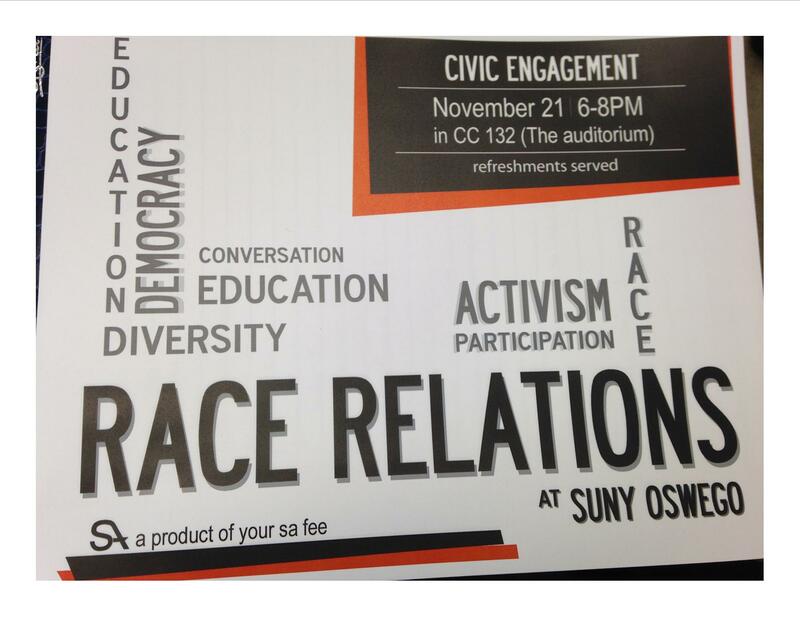 How diverse do you believe SUNY Oswego’s campus is : in which areas and at what levels? Do you believe that cultural celebrations (i.e. Black History Month and St. Patrick’s Day) serve as adequate responses to racial problems? What are the differences between “celebrating diversity” and challenging racial injustice? Which is more predominant on campus, and why? How can diversity be tied to notions of social justice? Again, the points made by each panel and audience member not only showed respect for others in the room, but a want to change the future of how groups of people interact on our campus. A special thanks once again goes out to those who made the event possible starting with the panel members, Chris Collins-McNeil, Chelsea Hamlet, and, of course, to those who attended. Leave your comments below and follow us on Twitter @SUNYOswegoCE for updates. Have event ideas? We would love to hear them. Email us at Civic@oswego.edu. Race is a big issue in the United States and the subject is often neglected in educational conversation. To help combat that lack of conversation, join us this Thursday at 6pm in the Campus Center Auditorium as Civic Engagement, Student Association, BSU, LSU, CSA, and ASO discuss Race Relations at SUNY Oswego and answer some important questions about the people who make up our campus. Referendum No. 2: Shall the supervisor’s term of office commencing Jan. 1, 2016, be increased from two (2) years to four (4) years? Referendum No. 3: Shall the superintendent of highways term of office commencing Jan. 1, 2016, be increased from two (2) years to four (4) years? Referendum No. 4: Shall the town clerk’s term of office commencing Jan. 1, 2016, be increased from two (2) years to four (4) years? Authorizes up to seven casinos in the state as allowed by the Legislature, with the goals of creating jobs and generating tax revenue. Allows disability credit to be retroactively applied to Civil Service exams if a veteran took the exam before being certified disabled. Continues allowance for cities, towns, counties and villages to exceed their debt limits in order to pay for sewage facility construction. Resolves a century-old dispute between the state and private parties over land in the Adirondack Forest Preserve. Allows a mining company to expand its operations into 200 acres in the Adirondack Forest Preserve. Raises the mandatory retirement age to 80 for Supreme Court justices, up from age 76, and Court of Appeals judges, up from 70. Today is Fat Tuesday aka Election Day. For SUNY Oswego students, this can be a difficult and confusing process, but we’re here to help. For on campus residence, you can go down to Campus Center Room 133 to vote for City, County, and State legislators and proposals. For off campus residence, visit vote411.org to find your polling place or CanIVote.org to find out if you’re registered and more information about voting today. Gary Thibodeau was convicted of kidnapping Heidi Allen in 1995, and his appeals ran out in 1999. Things appeared bleak for all parties involved as time moved forward into the 2000’s. But new light was shed on the case in 2013 when a woman came forward to say she had information about who may have kidnapped Allen in 1994. Syracuse fans packed the Irish pub near Madison Square Garden before, during and after games for decades. Saturday's temperatures will be near normal while Sunday will briefly rise above normal. The Eastern hellbender salamander may not be a looker. But its sensitivity to pollution and changing water conditions makes the creature a useful indicator for water quality in rivers and streams. The document will be provided to lawmakers only after a press conference about it by Attorney General William Barr. The massive blaze that ripped through Notre Dame Cathedral collapsed its roof and spire, but some of its treasures survived. Here's an up-close look.